This Friday night at 7:15 pm, the Lehigh Mountain Hawks will meet one of the nation’s most storied basketball programs, the Duke Blue Devils, who are lead by Hall of Fame coach Mike Krzyzewski (Coach K). Lehigh, a #15 seed, comes in as a massive underdog, against the #2 seed Blue Devils. Many experts and the wider public don’t give a Lehigh a chance in the game; however, the NCAA tournament is nicknamed “March Madness” for a reason. Crazier things have happened. As the Lehigh University Economics Society blog, Centives decided to show its support for the Mountain Hawks by looking at Lehigh’s chances of shocking the world, beating the odds, and upsetting Duke. Four #15 seeds have upset #2 seeds since their first inclusion in 1985 when the NCAA tournament expanded to 64 teams. In 108 games the #15 seeds have won 4 times, meaning that this kind of upset only happens about 3.7% of the time. This isn’t very high but it’s better than zero. It has happened in the past…and it will happen again. The last time it happened was over a decade ago, so it’s about time for a repeat. Is there a chance that Lehigh is better than the typical #15 seed and close in talent level to the Blue Devils? Duke only has one more win than Lehigh; Duke’s record is 27-6, while Lehigh’s is 26-7. Lehigh has a higher point differential (11 points) than Duke (9 points), although Duke plays much harder competition in the ACC. Duke’s leading scorer is a Freshmen NBA-prospect Austin Rivers who averages 15.4 points per game. 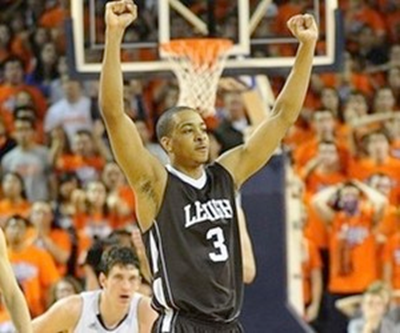 Lehigh has an NBA-prospect of their own; however, in Junior shooting guard CJ McCollum, who averages 21.9 points (making him the 6th best in the entire NCAA) and 6.5 rebounds per game. McCollum was also Patriot League Player of the Year this season. Lehigh has the guard play to keep up with Duke, just ask ESPN. Duke’s size could pose a problem for Lehigh. Lehigh has no players listed over 6’10”, while Duke has four players who are 6’10” or taller. Also the game will be played in Greensboro, NC, making it essentially a home game for Duke meaning that the referees might favor the Blue Devils. The height and home court disadvantage don’t seem to faze the Mountain Hawks who have been exuding confidence. ESPN Insider’s game simulator gives Lehigh a 15% chance of pulling off the upset, which is much higher than the 3.7% that is shown from past history of these types of matchups. Centives thinks that Lehigh has a legitimate shot at beating Duke, because McCollum has the ability to take over the game and most NCAA games are won by good guard play. Also Lehigh comes in extremely hot, winning their last 8 games, and they could catch the Blue Devils napping. For these reasons Centives will go above ESPN’s projections and give Lehigh a 20% chance of pulling off the upset and getting their first ever NCAA tournament win Friday night. Furthermore Centives does take pride in noting that we’ve already won where it counts the most. Meaningless Information did their own NCAA Tournament “Bracket”, but instead of basing the predictions on basketball talent, they were based on starting median salary in a sort of “Nerdy Bracket”. Lehigh was the National Champion, defeating Harvard in the final. Check it out for yourself. Enjoyed this article? You might also want to play around with our Japanese Baseball Player Value Calculator or see the Centives Moneyball inspired line-up. You can find those and other interesting things in our Editorials although if you want a selection of our most popular check out the Greatest Hits. You might also want to follow us on Twitter or Facebook to get the latest and greatest from Centives. For more sports economics check out Centives contributor Glenn DuPaul’s own blog. ← Why is North Korea Always Hungry?